If you watch TV, Guy Fieri is pretty hard to avoid. The reality television star is the host and producer of a slew of successful Food Network programs. While he might not be the best chef in the world, his blend of boisterous style, personality, and cooking talent has made him one of the culinary world’s biggest stars. To me, Guy’s success story is something to admire. 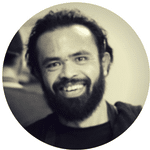 He’s done an incredible job of cultivating his talents and bringing them to the forefront. Cooking doesn’t have to just be about the recipe. When I watch Fieri cook, it’s clear that he values educating others, having fun, and creating over-the-top dishes that anyone can enjoy, even if they’re not a food critic. Fieri has endorsed a fairly popular line of cookware. Let’s dive right in with a review of one of his top cookware sets. First of all, let me state that there’s a trend among cookware sets to offer a million accessories and doodads along with the pots and pans. Guy Fieri’s nonstick cookware set comes with one of those funny wedge spatulas, tongs, and nine measuring spoons and cups. This means that the 21 piece set is less than half cookware. The price is still pretty comparable to a set of just pots and pans, but it’s worth noting that this 21 piece set has only 6 pots and pans in total. Just like other celebrity endorsed cookware sets (including Paula Deen), Guy’s line is available in at least three colors. Personally, I’d choose the vibrant red due to Guy’s fiery personality, but you can also get this set in black and teal. All three options have a polished solid color exterior and a non-stick ceramic interior that’s very effective at preventing food from sticking. I’m personally an advocate of ceramic non-stick over the traditional Teflon-style non-stick coating. To me, it’s not about toxic chemicals or oven safety, but rather about how each style of non-stick fails. 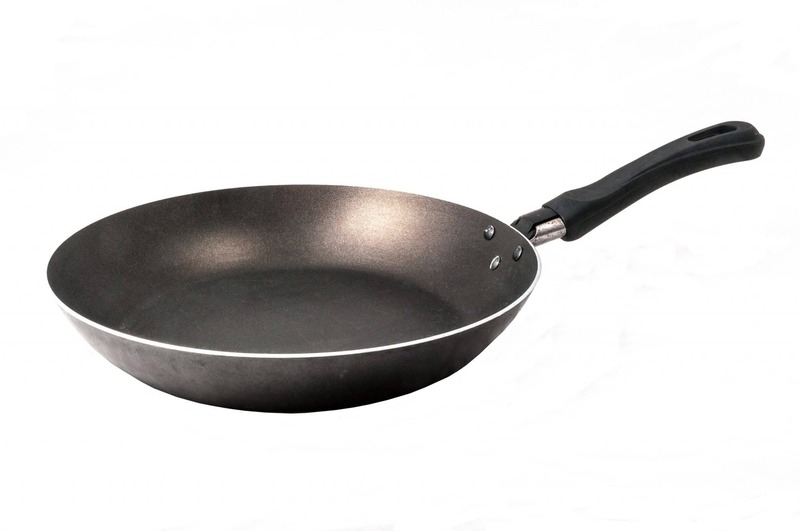 PTFE (or Teflon) non-stick will chip and flake, which means that your pots and pans will go from being great and useable to totally unusable overnight. Instead of flaking off, ceramic non-stick will gradually wear out over time. This means that you’ll have a pretty generous period of time when your pots and pans will be a bit more sticky but still totally usable. You’ll have plenty of warning before you need to purchase replacement cookware. All modern non-stick pots and pans have a finite lifespan that varies based on how you use, clean, and store them. In my experience, this lifespan is between two and five years. This means that you should expect to replace this Guy Fieri cookware set after a couple of years of use. During those years, you’ll enjoy functional, well-designed non-stick cookware that will brighten up your kitchen. The set is pretty cheap, too, so there’s no need to worry about having to replace it eventually. So how does it perform on the stove? It’s clear that this aluminum cookware line was used by a professional chef at least once or twice during the design process. Not only does the aluminum construction serve to distribute heat evenly and help the pots and pans heat up quickly, the design details facilitate easy use. The handles have injection molded silicone exteriors that keep your hands safe while you handle hot pots and pans. They’re connected to the bases with solid rivets that won’t wriggle or unscrew after many months of hard use. The glass lids fit very well and have small steam vents that help keep rattling to a minimum while you observe your food. This isn’t necessarily my favorite cookware set overall, but its’ definitely one of my favorite celebrity-endorsed cookware lines. While I think the “21-piece” moniker is somewhat misleading, it does mean that this cookware set has lots of kitchen essentials for a first-time cook or someone who’s moving out on their own. It’s a great inexpensive starter set for your new home or apartment and a great set to give to a vibrant young person who’s taking the next big step in their life. This set is quite similar to the offering above, but it differs in two important ways. First, it only has the 6 pots and pans in the box, along with four lids. The pots and pans themselves feature the same solid aluminum construction, silicone handles, and durable rivets. Inside the pots and pans, however, you’ll find a “traditional” PTFE non-stick that’s just like the Teflon you’re familiar with seeing. As I said above, I’m a very slight fan of ceramic non-stick over Teflon for a couple of reasons. That said, the non-stick in these pots and pans will perform very, very well and will have a pretty comparable lifespan to the ceramic coating in the set above. If you prefer this older style of non-stick or you’ve found this set on sale, it’s a very viable alternative to the larger set above. You don’t get the extra 11 pieces of assorted kitchen tools, but you can always pick those up separately. I personally think that this cookware set beats many low-cost cookware brands, including Tools of the Trade and other store brands. It’s a solid, durable non-stick set that will perform very well for its limited lifespan. The bold stylings and low price help give it a slight edge over other budget cookware sets. While I’d probably choose the ceramic set for myself, this stripped down PTFE set is still a great buy. In addition to the large non-stick sets above, Guy Fieri has endorsed a few individual pots and pans you can find. Let’s go over the more interesting offerings and learn how you can spice up your kitchen. Cast iron is pretty big among many internet influencers. It’s not suited for every cooking task due to its unique properties, but it’s definitely got its upside. This cast iron pan is quite inexpensive and is perfect for getting started in the world of cast iron cooking. The most important part of this product is that it comes pre-seasoned out of the box. 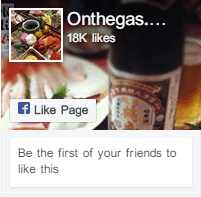 This means that you can skip the complicated and lengthy process of seasoning your own pan. If you’re a cast iron veteran with your own favorite seasoning process, you can simply remove this pre-applied seasoning with a bit of dish soap and season your pan the way you want. The exterior of this pan is coated with a porcelain enamel that allows it to be used on induction ranges and glass top radiant stoves. This is a downside when it comes to very high-temperature searing (since the enamel doesn’t like temperatures above 400 F), but it’s perfect for everyday cooking. 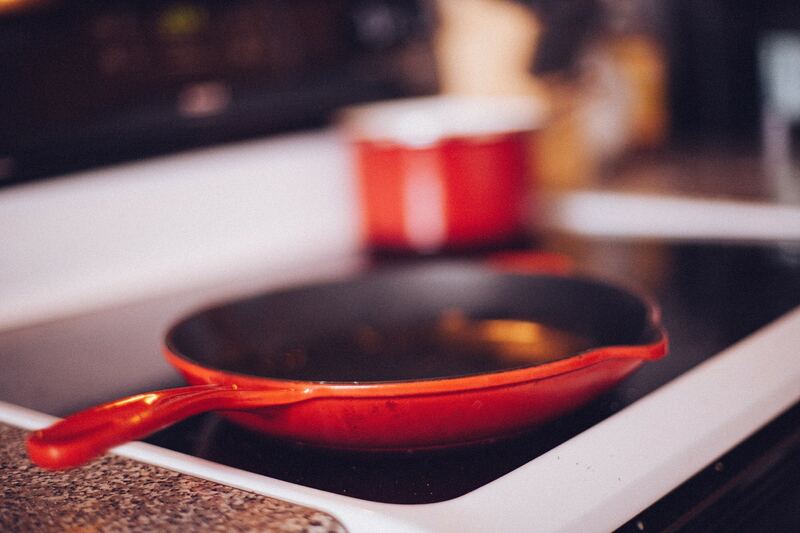 Cast iron’s advantages include better heat retention, incredible performance on induction ranges, and the ability to be “non-stick” without a coating that will stop working in a few years. This affordable Guy Fieri cast iron pan is a great way to experiment with cast iron without spending a lot of money. You’ll be able to use this pan for many, many years. If you want a non-stick pan with a unique Fieri style, this decorated frying pan is a great addition to your kitchen. It’s incredibly inexpensive and features a comfortable handle, an effective non-stick interior, and a boisterous eagle design on the bottom. It’ll look great hanging from a peg in on your kitchen wall. While this pan is cheap (making it a great supplemental egg pan), there’s one big downside to having the graphics on the bottom of the pan. I don’t know about you, but the bottoms of my pots and pans get pretty dinged up and grimy if I’m not extremely diligent with how I cook and clean. If you actually use this pan on a regular basis, the graphic eagle will almost certainly be covered with the marks of cooking use. Still, the low cost of this frying pan means there’s not a lot of risk. You can easily pick one up as a display piece or use it as an egg pan without breaking the bank. If you want something a bit less graphically busy, this non-stick frying pan is still vibrant and loud without having an eagle on the bottom. It’s quite inexpensive, too. You essentially get a single, small frying pan from the PTFE-nonstick set above. If you want to try Guy Fieri’s cookware without making a big financial investment, this frying pan is the perfect piece to use for your trial. 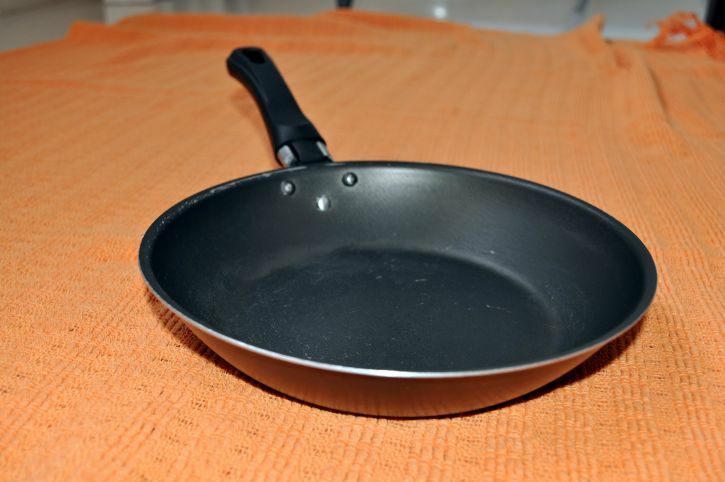 It’s very inexpensive and will offer you a fantastic small pan you can use for chicken fillets, eggs, and other sticky dishes without worry. It’s also a great piece to pick up to supplement your primary cookware set or replace an egg pan that’s worn out over the years. Dutch ovens like this Guy Fieri cast iron pot have been around for centuries. 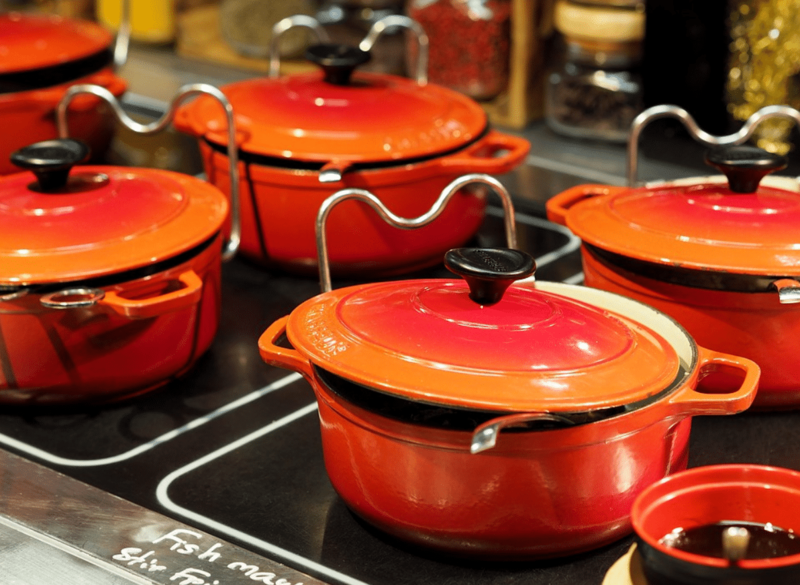 The combination of cast iron and enamel is fantastic at absorbing heat and keeping it trapped right in with your food. 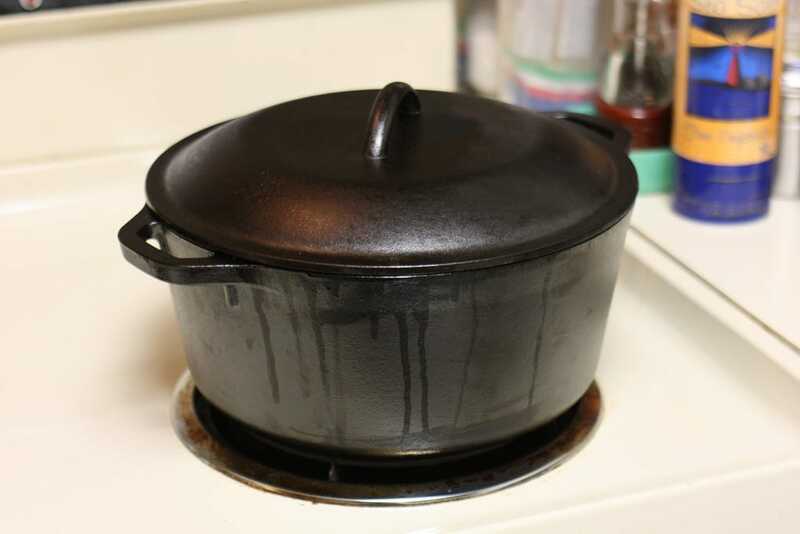 If you find yourself doing a lot of slow cooking, whether you’re making brisket, stew, chili, or another dish, having a cast iron pot like this is invaluable. Before you rush out and buy this pot, consider two things. First, the quality of the construction is somewhat variable and not necessarily up to the standards of a famous brand like Le Creuset. Second, it’s actually pretty hard to find this pot online. While it’s listed on Amazon, it’s not always in stock. Check out our other reviews of cast iron pots for other options. You’ll lose out on the celebrity branding and not much else. While this inexpensive chef’s knife is said to be made from high-carbon German steel, it’s not up to the same quality of construction as a Victorinox or JA Henckels knife. 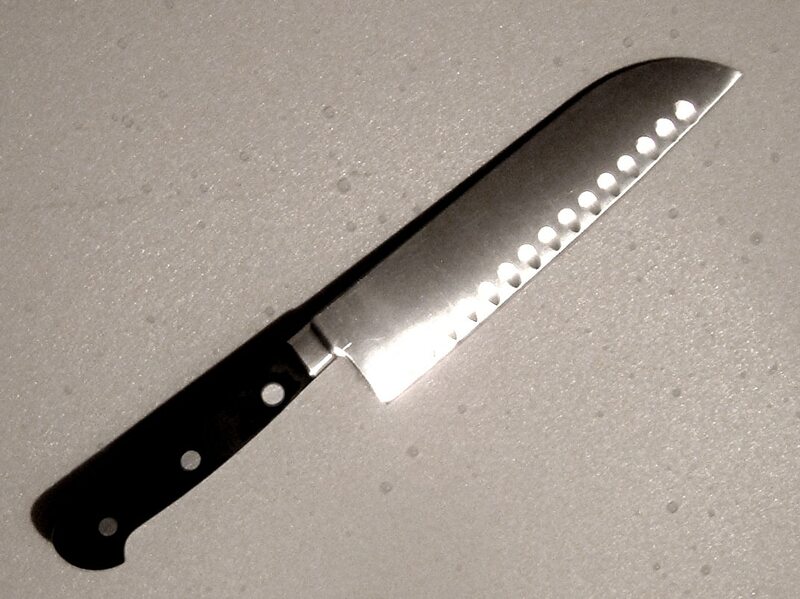 It does a fairly good job of holding an edge, but the knife itself is fairly fragile and prone to breaking. The knife itself is very cheap, however, meaning that it’s an okay purchase for someone without a chef’s knife at all who just wants something for a few months while they decide what high-end brand to go with as a more permanent solution. It’s worth noting that while customer reports indicate that this knife will rust, this is actually normal for a high-end chef’s knife. High carbon steel isn’t particularly good at fighting off corrosion, meaning you need to carefully dry it each time you hand wash it. Knives are made from this sort of steel because of the way it holds a fine cutting edge and not because of how easy it is to clean. Despite the fragility of this knife, I’d definitely consider it if I was getting a gift for a friend who wasn’t super into cooking. I’d warn them about the durability concerns and mention that I’d be happy to suggest a more expensive knife (probably a Dalstrong or a Victorinox) if they find that they love the way it cuts. The edge on this high-carbon Guy Fieri knife is nothing to sneeze at and provides a great introduction to the world of higher-end chef’s knives for just a few dollars. 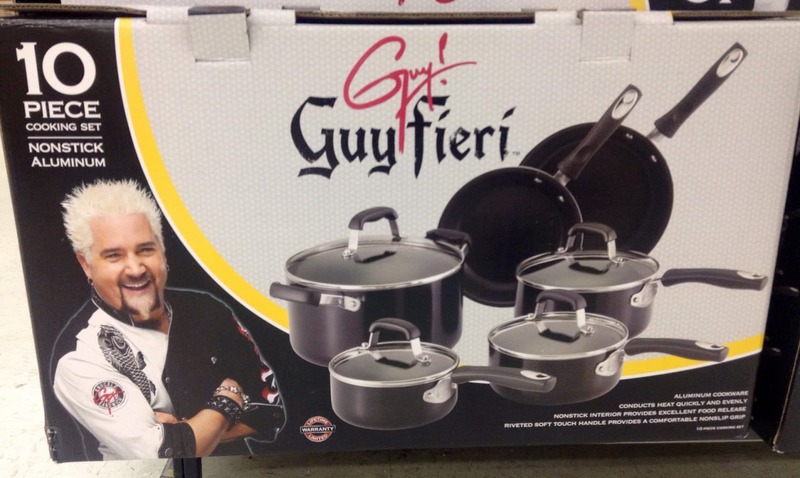 Guy Fieri: Celebrity Chef, Cookware Expert? Fieri’s personality and charisma have cemented his place in the world of television chefs. His cookware lines are quite solid, too. While they won’t necessarily beat out a high-end All-Clad set, they’re a slight step above lines endorsed by other celebrity chefs like Paula Deen and a fierce competitor to store brand sets like Tools of the Trade and Kirkland. If you’d like a colorful, inexpensive set of non-stick cookware for your kitchen, you may want to consider Guy Fieri’s vibrant cookware lines.